The colors and scent of autumn bring to my mind two things – my mother, who taught me to treasure nature and its many wonders, and the poetry of Robert Frost. As it would happen, they are both very much related since she was the one to introduce me to Frost’s writing with a small book of his poems tucked into an Easter basket when I was a young girl. I still treasure that little blue book! While the days of this October are coming to an end, I have been savoring the beauty that arrives this time of year with golden hues and bright bursts of red. It is so extraordinary and so fleeting that if you don’t stop to draw a bit of it inside you there’s the chance you might miss it entirely. The words of Robert Frost came to mind yesterday as I was out walking and taking photographs of the autumn colors on the Amalfi Coast. Slow, slow. There is always enough time—I am starting to realize—but only if you make it. 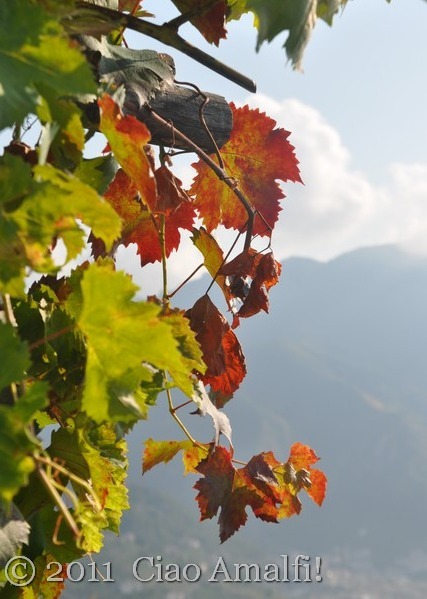 The passeggiata—a leisurely walk or stroll—is one of those wonderful Italian traditions that you can enjoy across Italy. This is a time for families and friends to spend together catching up on the day’s news, for kids to play together and to just enjoy a healthy bit of fresh air. 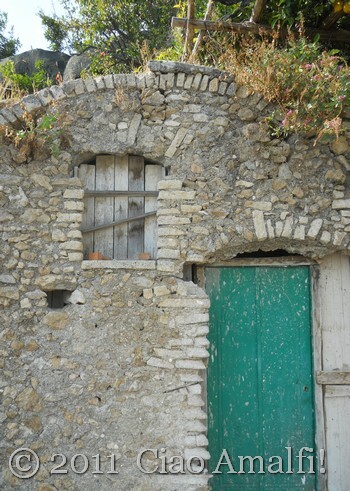 On the Amalfi Coast, where horizontal space is decidedly challenged, the passeggiata often takes on a meandering form through town. 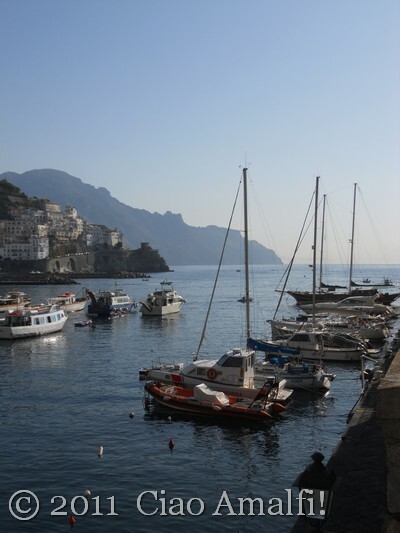 In Amalfi, however, locals take advantage of the relatively wide port with three piers for the traditional passeggiata. 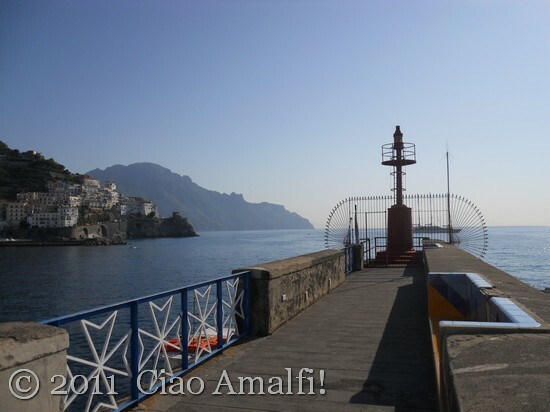 It can be a short and quick walk down one of the piers, or a longer walk to the end of the port to the little red lighthouse that marks the tip of Amalfi’s largest pier. Can you spot it in the photo above? 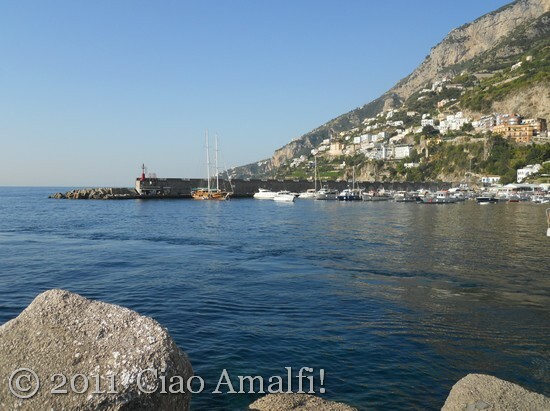 I invite you to come along with me on a walk to the port in Amalfi on a beautiful October morning. 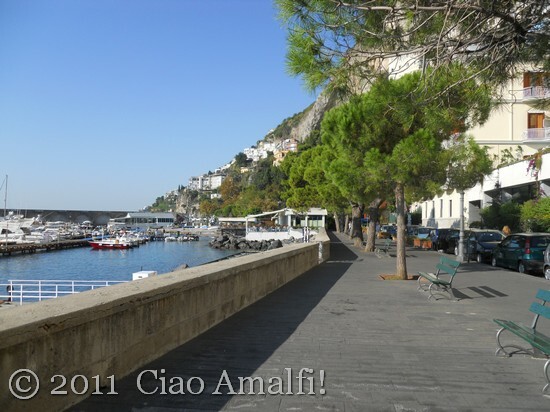 From the center of Amalfi, follow the small street leading to the long pier the defines the end of the town’s harbor. 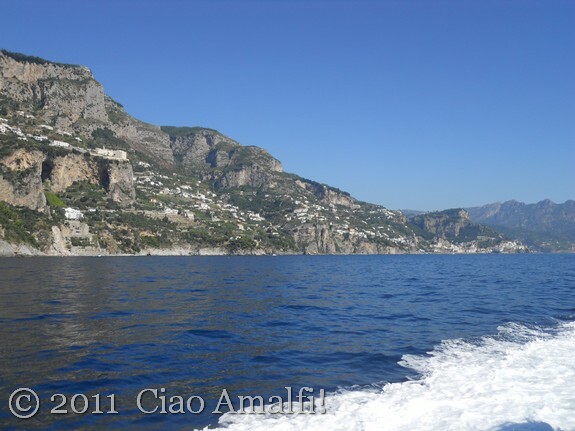 You’ll pass the smaller pier where the ferries depart for Capri, Positano and Salerno. You’ll leave behind you the crowds of tourists arriving or waiting for the next departure as you head toward a quieter part of town. 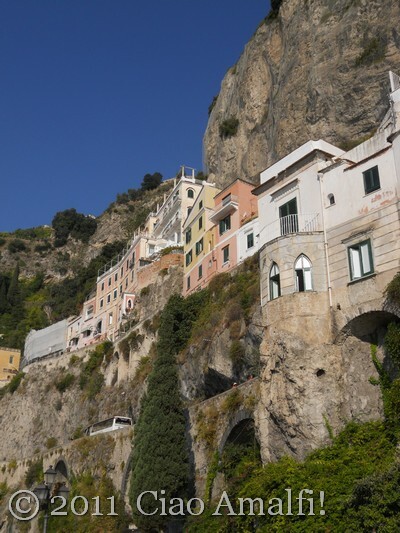 Don’t forget to look up along the way to see how the buildings of Amalfi have been built right into the side of the mountain. It’s an amazing sight! Along the way you’ll pass some benches that are popular year round for enjoying the sun and chatting. I was out early in the morning, so there were still plenty of spaces open. 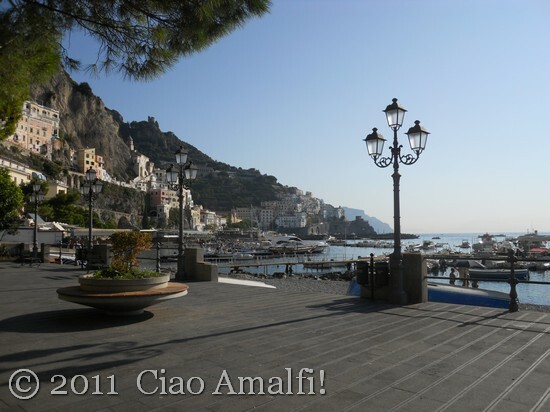 Toward the end of the port you’ll pass through a larger part of the sidewalk with benches and a beautiful view looking back toward Amalfi. 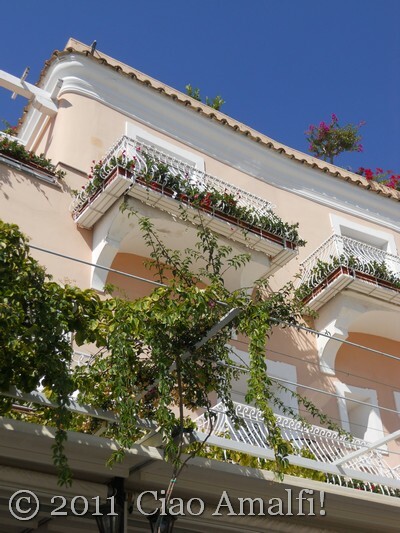 During the summer, and just about every evening of the year, this is where families gather in Amalfi, and you’ll have to dodge soccer balls and kids learning how to ride their bicyles as you stroll through. 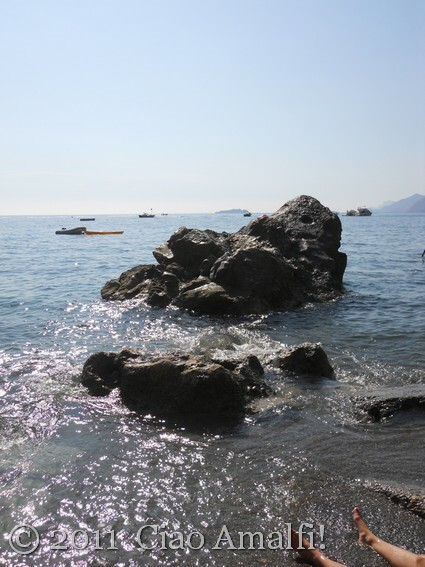 The beautiful Sirene beach is located behind the port, and it’s a great spot for swimming in the summer when Amalfi’s Marina Grande beach in the center of town is crowded. Climb up the small flight of stairs to walk along the top of the pier. The view is outstanding! If you want to know where locals exercise, this is the spot. Friends walk up and down the pier and talk about lunch plans and shopping while getting a bit of exercise. 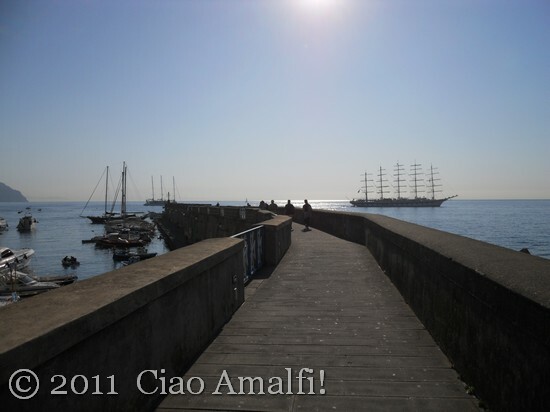 The morning I was out taking these photos, the harbor was busy with two cruise ships. Such an inspiring view while walking! Locals sometimes walk along the lower part of the pier as well, which is also a nice walk near the boats. On a nice day, however, I can’t resist the views from up above! There are tile covered benches along the way if you want to stop for a rest or simply enjoy the sunshine and panorama of Amalfi. Now we’ve reached the red lighthouse at the end of the pier. Are you ready for the view? While it doesn’t seem like you’ve walked very far, the perspective looking back toward Amalfi is spectacular from the end of the port. It is equally stunning at night with the golden lights from town stretching across the harbor. 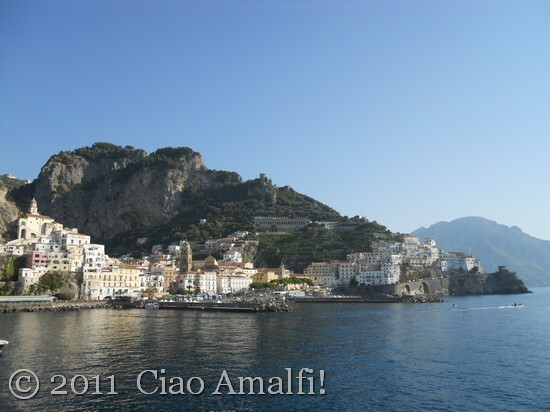 I hope you’ll join in with the locals and enjoy this passeggiata in Amalfi on your next visit to the Amalfi Coast! Not long ago, I changed the tagline of Ciao Amalfi from “Savoring Daily Life on Italy’s Amalfi Coast” to “A Writing Life on Italy’s Amalfi Coast.” This small change reflects a significant shift within myself, one that has been happening so gradually over the past four and half years that I had hardly even noticed. Life in a new country is all about savoring. As you look around and absorb your new home—slowly finding your own place and how you fit in—all you can do is enjoy the flavors of new foods, struggle your way through understanding a new language and discover the beauty of another landscape. Such a dramatic change of scenery takes time to absorb, and even more time to begin to see how it has changed you. As I struggled to find my way in the world of freelance writing two years ago, I brought the daily act of writing into my life in a new way – work. It has been a challenging and rewarding experience, but let’s just say that some days have been better than others. Over time, however, the good days have far outnumbered the difficult days. Along the way, something unexpected happened. Writing became a part of my daily life, something essential to be savored and crafted, much like cooking dinner each night. Since this past summer I’ve been pursuing some other projects that have kept me away from home and all those daily habits. This time away has allowed me to reflect on where exactly my passions lie and what I need to do to pursue them. The biggest hole I have felt over the past summer is the loss of my writing time each day. Just as I’ve been discovering the depth of my passion for writing, this morning brought me a perfectly timed treasure of inspiration from Diana Strinati Baur at A Certain Simplicity, as she shared about the experience of writing her novel and the decisions we make each day to pursue our passions. To write and publish the novel with my mother. There it is in all its simplicity and complexity – the thing that I am giving my heart and soul and mind and time to. Over the past months I have been slowly pulling away from the commitments that keep me away from my writing desk. I’m making decisions and changes with one thing in mind – the novel. It’s time. I’ve felt it coming for many months now, but it is finally time to be done with the trying and get busy with the doing. I am grateful every day to have such a passionate and inspirational companion to share this creative journey with – my mother. If you are in the process of working toward a goal or passion, wherever your creativity may lie, I recommend reading Diana’s post called Decide. It is a gift of inspiration that I know I will return to again and again. I look forward to sharing our writing adventures with you, and I hope you will share your creative journey, too! 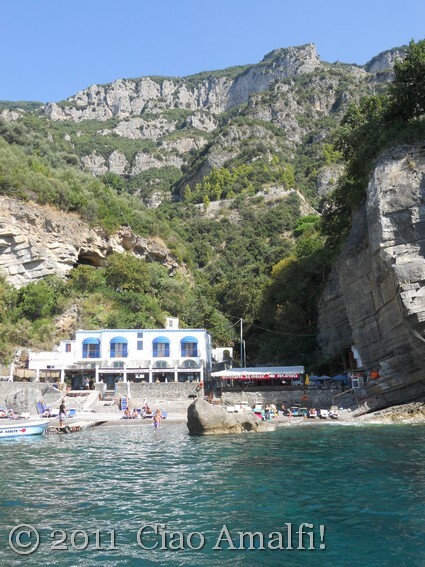 While I never need an excuse to hop on a boat and head to Positano, what lured me there on a stunning October day last weekend was an invitation from Eleonora from Aglio, Olio e Peperoncino to join her at Positano’s Laurito beach for the afternoon. 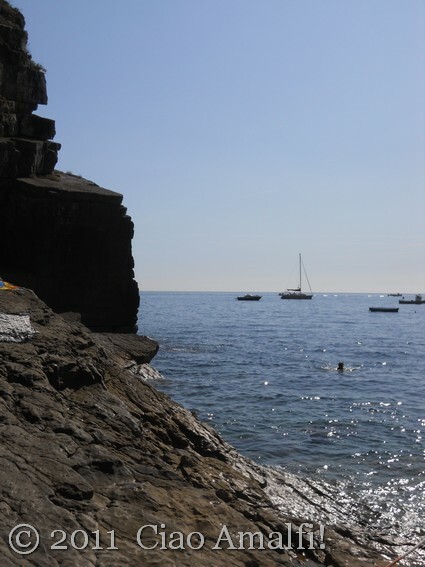 Eleonora had already tempted me to discover this secluded and tiny beach near Positano in an article she wrote about the Laurito Beach over at The Travel Belles. 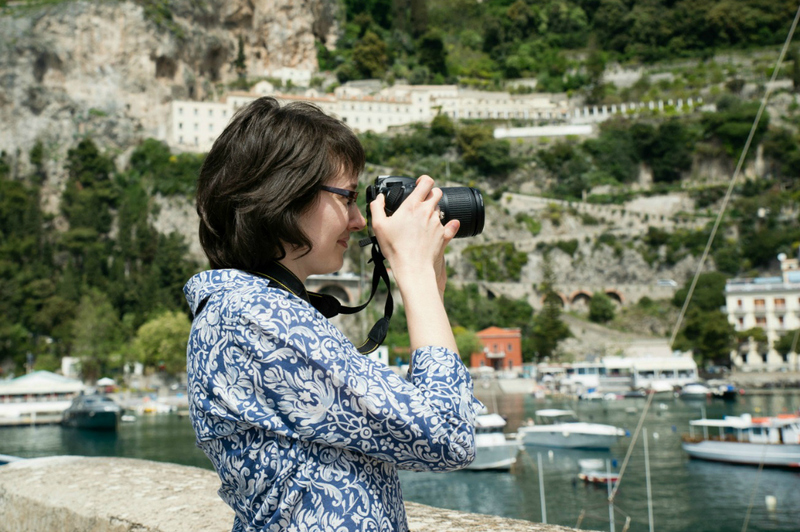 Peaceful, local and gorgeous – the best of the Amalfi Coast! 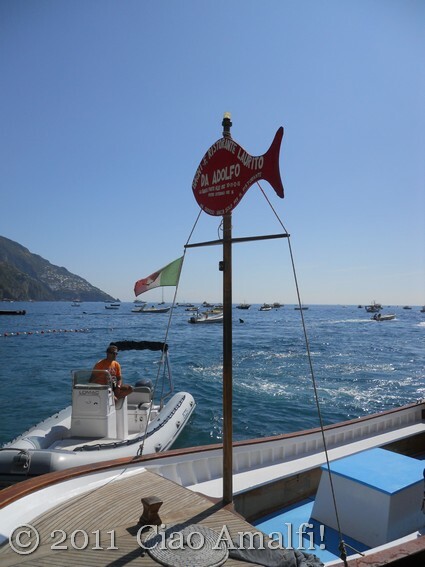 Following Eleonora’s great instructions, I waited at Positano’s main pier for the little boat with the red fish marked Da Adolfo, one of the two restaurants at the Laurito Beach. In the distance I spotted a tiny cove with two buildings. Could that be it? As the boat approached the shore, I could see the red sign for Ristorante Da Adolfo and Eleonora and her son waving from the beach. A magical beach experience was about to begin! The beach space is very limited, so you’ll want to arrive early in the day to get the best spots. The view looking down the Amalfi coastline is spectacular, with the Li Galli islands and even the Faraglioni off of Capri in the distance. I love this view, which isn’t visible from Amalfi. After playing in the sun and talking and talking, it was time for lunch! 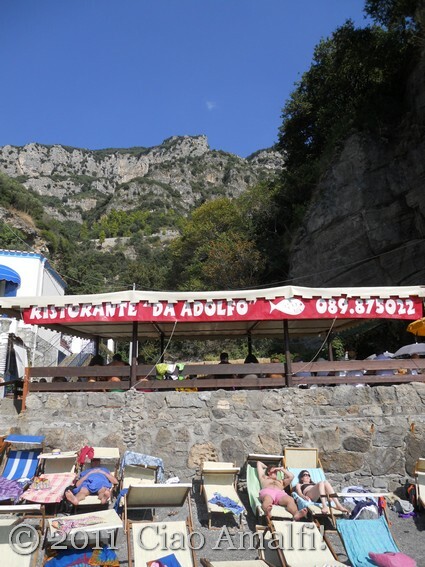 The Ristorante Da Adolfo is just a short flight of steps up from the beach, but with a pebbly floor and the seabreeze it feels as if you’re eating right on the beach. Boy was I lucky to be with Eleonora, because she knew just what to order! 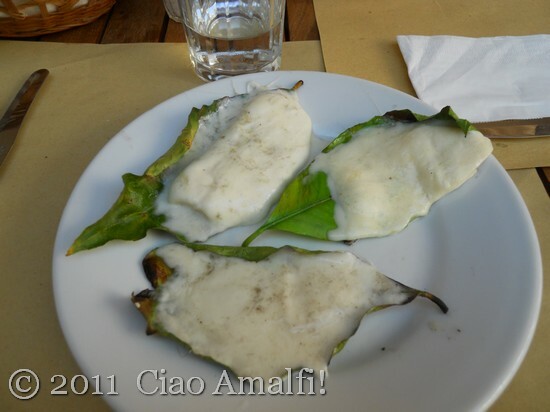 We started with one of her favorites, mozzarella grilled on lemon leaves. Delicious! After that there was a zuppa di cozze (mussels) that we just had to order after catching the tantalizing aroma wafting over from the next table. Yum! They were so good that neither of us even thought to take a photo – practically a miracle with two bloggers at one table! Mozzarella on lemon leaves ... heavenly! It was such a pleasure to meet Eleonora after years of emailing, writing together and following each other’s blogs. Meeting in such a beautiful setting was perfection. It felt a little unreal—the company, the wonderful conversation, the sunshine—all too good to be true! After a very busy summer, it was the moment of inspiration, connection and grounding that I had been searching for. 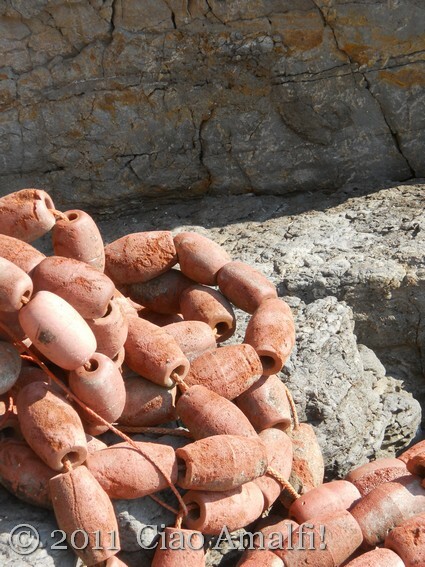 The faded color of these buoys scattered across the rocks caught my eye. They look as worn and rough as the rocks. An absolutely amazing day. That’s the only way to put it! Many thanks to Eleonora for inviting me to join her at the Laurito beach in Positano. I’m already looking forward to the next time! 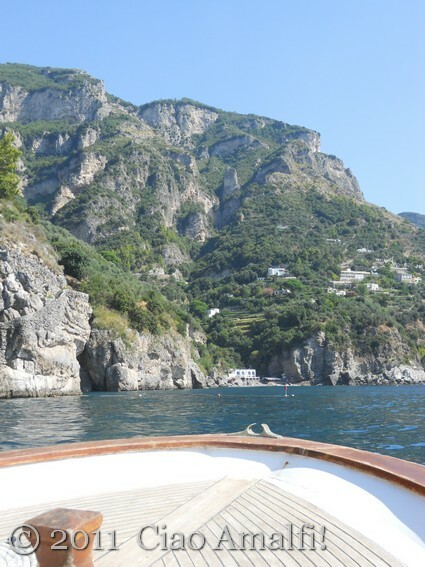 While you’re dreaming of a beach day on the Amalfi Coast, head over to Aglio, Olio e Peperoncino and check out Eleonora’s gorgeous photos of her escape to Positano for the Weekend! 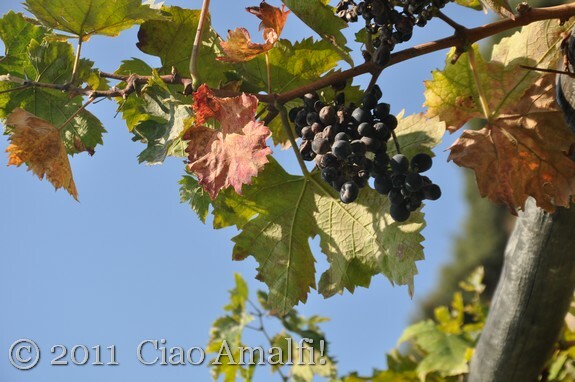 While clearing the breakfast dishes from the kitchen table yesterday morning, I heard on the news that this September was the warmest recorded in Italy in last 150 years. Looking out the window at a slice of vivid blue sea sparkling in the sunshine, I thought that was just about the nicest way to celebrate the 150th anniversary of Italy that I’d heard of so far this year. By the first of October, we’ve usually changed to our autumn wardrobe and are waking up to a chilly house in the mornings. Fortunately, this year the warmest September in 150 years has decided to spill over into the beginning of October. Yesterday with the sun shining and summer-like temperatures, it was the perfect day to take the ferry to Positano to enjoy this lovely gift – one last taste of summer before autumn arrives! 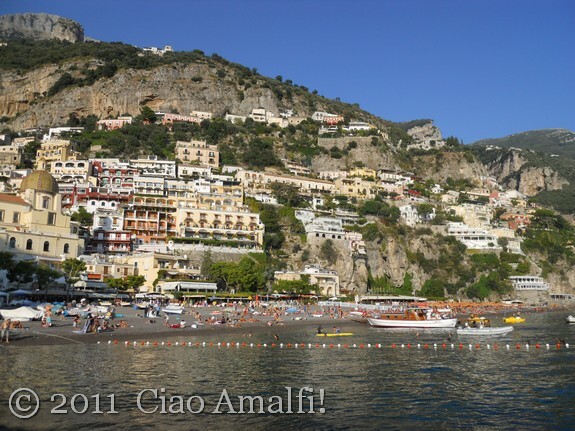 Amalfi was busy and crowded like a summer day with groups of tourists arriving by boat and bus. 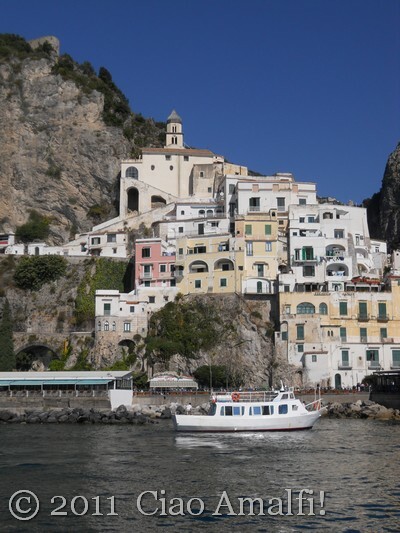 I squeezed through a large group of visitors that the Tour Guide was showing around Amalfi and made by way down to the end of the pier to catch the ferry to Positano. While the top of the ferry filled up with tourists, I found my favorite spot on the lower level next to an open window. The same fabulous view without the wind and being baked in the hot sun! I like to watch the rainbows dance on the waves created by the boat. I caught it a little bit in this video, which also shows the pamorama from Praiano on the left to Capo di Conca on the right. 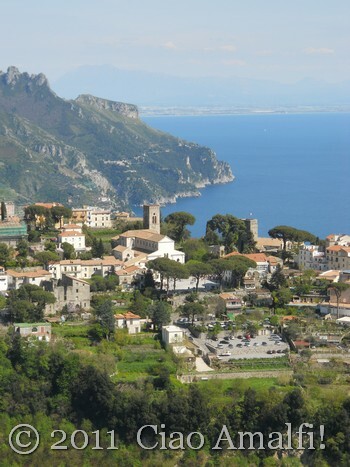 Once around Capo Sottile in Praiano the view opens to Positano in the distance. Set in a steep valley, the town sprawls out in all directions fitting into every knook and cranny of the mountainside. Always a beautiful sight to see! 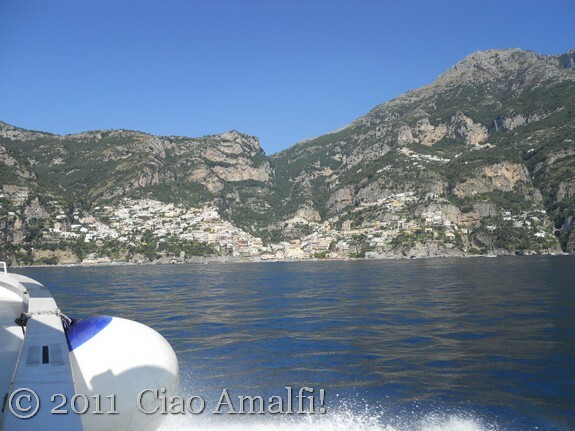 If Amalfi felt like July on the first of October, it was fully August in all its glory in Positano! 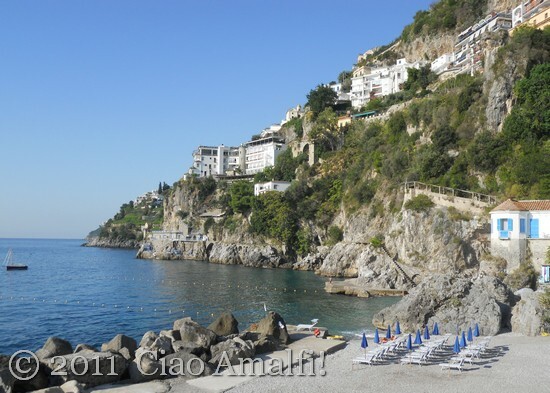 It is always warmer in Positano than Amalfi, but yesterday the difference was really striking. 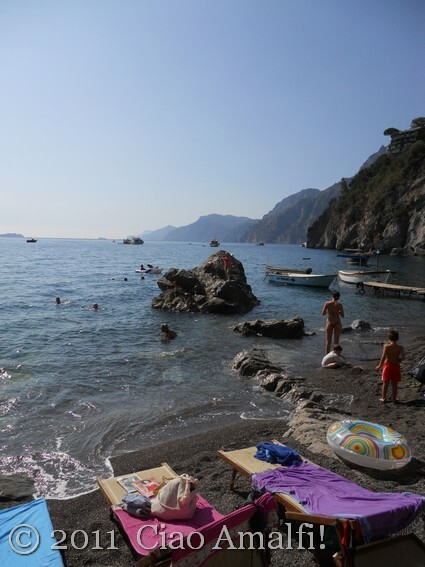 The beach was filled with sunbathers when I arrived at noon, and the colors throughout town made it feel every bit like summer was holding on strong in Positano. 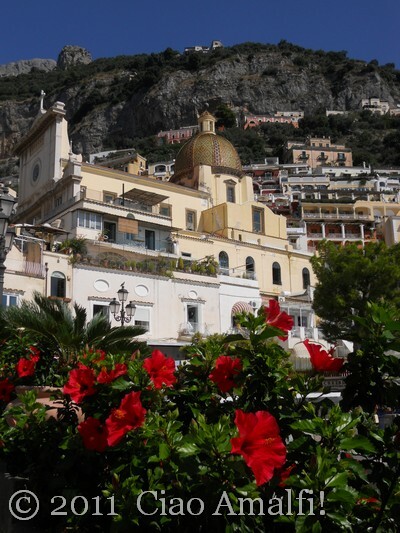 I walked around town just a bit mesmerized by the colors and the beauty of Positano. It always gets me! Even though it’s only a 25 minute ferry ride away from Amalfi, I feel like I can still go on vacation, so to speak, in Positano. The town has such a different feel from Amalfi and Ravello, and a day there away from the cars and traffic is such a treat. I was filled with a bit of nostalgia as I stopped to take photos and enjoy the colors of Positano, because I know that winter will be here very soon. While I love the change of seasons, it is hard to let go of these colors and the warmth until next spring! Pushing thoughts of the cold and damp winter out of my mind, I wandered back through town in the direction of the pier in Positano. The large beach was very tempting in the sunshine, but I had even more alluring plans for the afternoon to visit a tiny beach near Positano where I had never been before. 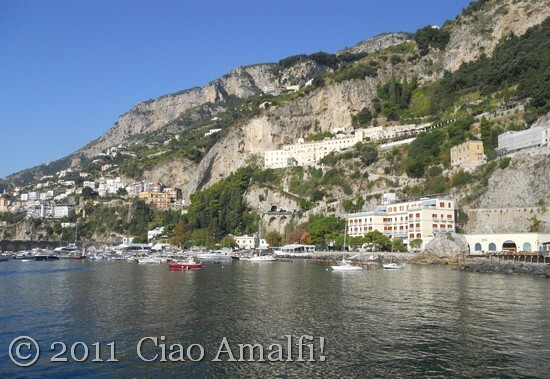 Stop by later this week and I’ll share with you a little secret that a good friend shared with me in Positano. You’ll love it!